CHESTERFIELD Tankard-signed Nuart-Note the straight sides. 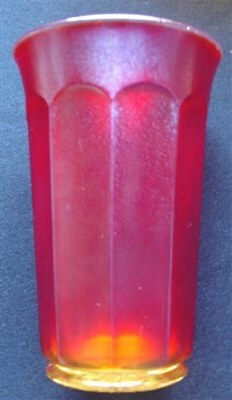 CHESTERFIELD #600 Tumbler in Red - incorrectly called Colonial Stretch at times. 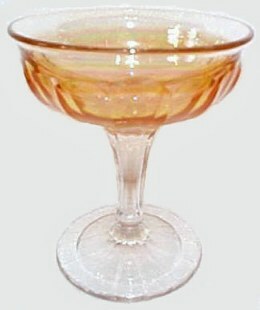 CHESTERFIELD Compote - Mgld. 5 inches high x 4 1/2 inches wide. Has the Iron Cross mark. 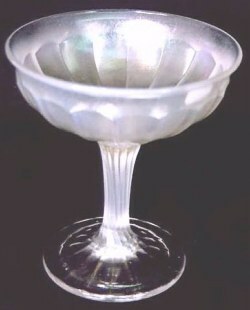 This CHESTERFIELD Rosebowl has the Iron Cross inside center. Taken from Imperial Catalog #104A. #600 Imperial Factory Designation-TOOTHPICK-Iron Cross on base. 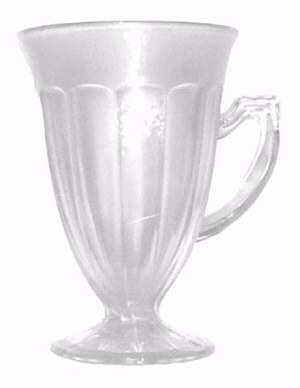 CHESTERFIELD Lemonade Mug - White. Courtesy Bob Smith. CHESTERFIELD Compote-Red-10.75 in.diam. x 7 in. tall. 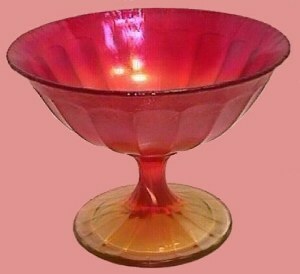 CHESTERFIELD Sherbet in Red- 3.5 in. tall. 2 inch open Table Salt next to the Tooth Pick. 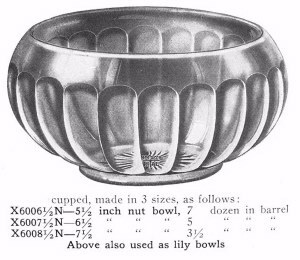 Early Imperial factory catalogs designate this design as their #600 line, with later catalogs stating the illustrations as the Chesterfield pattern. Flute Variant, Colonial and Wide Panel are erroneously used names for some items in this line, but we need to become accustomed to using the name Chesterfield when referring to this lovely line of Imperial products. An easy way to distinguish them from Flute #700 and Colonial #593 lines is to take a close look at the handles on the Chesterfield pieces. They are flat at the top portion. Handles on the Flute and Colonial items rise to a distinct point at the top. 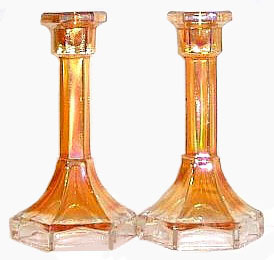 Candlesticks are known in two sizes: 7 1/4” and 9”. Marigold, smoke, clambroth, red, white, amethyst and teal are known colors. These are the designated shapes within this #600 Imperial line aptly named Chesterfield by collectors. 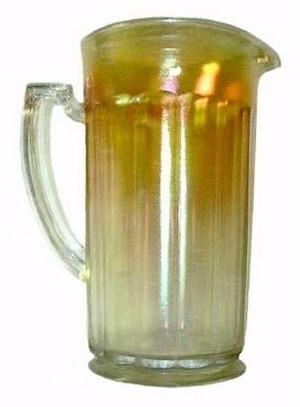 Tankard pitcher, covered: celeste blue, marigold, teal, red and white. The example we picture lacks a lid, but it is the only pitcher in this pattern seen in our many years of collecting! Rare?. Most certainly. Tumblers-5”: celeste blue, marigold, teal, red and white. 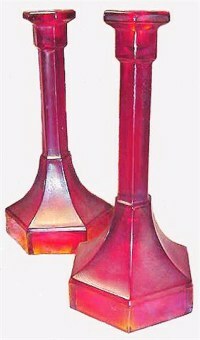 These nearly always display a stretch appearance in the finish. 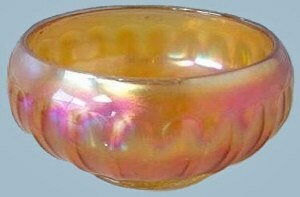 Small compotes: This 5”- 6” diameter compote is also found in marigold, red, red/amberina, clambroth, teal and celeste blue and white. Rose bowl, collar base: marigold, smoke, clambroth. These are not often seen, with smoke examples being very scarce. 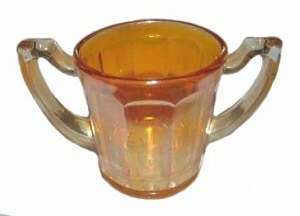 Toothpick holder, handled - marigold: This is one of the items which has been labeled Flute Variant, but the handles are identical to those of the mug and the tankard. The toothpick is shown in old Imperial catalogs under the #600 designation, making it part of the Chesterfield line. Mug, handled: Known in marigold and white. Perhaps other colors exist. 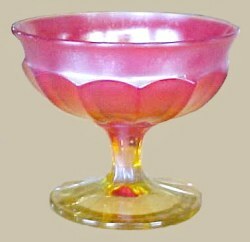 Large compote: This 10 ¾ ” diameter compote shown here in red, has been called Wide Panel, in error. This too is part of the #600 line. Marigold, clambroth, teal and celeste blue, red/amberina and white are additional colors. Sherbet, stemmed: marigold, clambroth, smoke, celeste blue, white, red, red/amberina and teal are known colors. Tiny 2” tall open salt: signed with the Imperial Cross mark is known in marigold. It has a cupped-in top opening. and to whom much has been committed, of him they will ask the more. A teachable heart is one of the most critical elements of the follower of Christ. Grace is an unearned blessing given by God to an unworthy recipient.